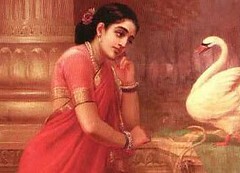 The painting on the left is Raja Ravi Varma’s Damayanti and the Swan. The image on the right is from a song in the movie Ananthabhadram. The song, Pinakkamano was based on the paintings of Ravi Varma. This year Ravi Varma has been in the news in both movies and archaeology. Two Italian curators Enrico Castelli and Giovanni Aprille restored some lithographs of Ravi Varma which were found in his press in Maharahstra. These are now on display as part of an exhibition. Now Shaji N Karun is making a Hindi movie on Raja Ravi Varma. Conceived as a death centenary tribute to the creative genius whose paintings are greatly appreciated in India and abroad, Shaji plans to start the film after finalising the cast soon. This movie is based on Ravi Varma’s association with a model Suganthi, who inspired some of his best works. Ajay Devgun is playing the role of Ravi Varma and Bobby Bedi is the producer.